This is my very first post on this blog. I am not a grandmother yet - just a “expectant” one. My daughter, Fran, and her husband, Josh are expecting their first baby in June. It is so close and yet so far away! I am a nonprofit consultant and have a blog associated with my business. You can visit that blog at http://marionconwaynonprofitconsultant.blogspot.com. I love blogging and reading other nonprofit blogs so much that I decided to blog about the new adventure of becoming a grandmother. First I thought I would visit exisitng grandmother blogs but I didn’t find much. 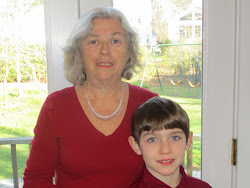 If you are a grandmother who is blogging, please leave a comment - I want to start a blogroll as soon as I have enough other blogs to recommend. Right now we are getting in high gear with planning. Today Josh and his Dad are putting together the crib and soon the rocking chair we ordered will be pulling up at Fran and Josh's front door. I am planning the baby shower at our home and over 40 invitations are in the mail. Am I crazy? Well that was a sweet post. I saw you mentioned your blog on grandparents.com and I just happened to write it down. Sounds like you are so excited you just had to put it into words! I have a 3 & 1/2 yr old gdaughter whom I just can't get enough time with. You have some great moments ahead! !Good luck, Minnie. The Baby Shower - It Will Be Wonderful - Right?